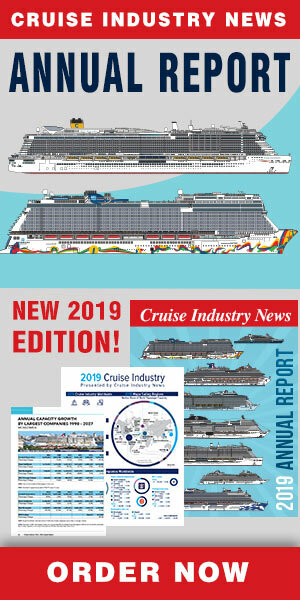 A new main dining concept and all new specialty venues along with some innovative technology will greet guests aboard Celebrity’s new Edge when she debuts in Port Everglades this November. “Culinary is in our DNA,” said Lisa Lutoff-Perlo, president and CEO, in an exclusive interview with Cruise Industry News. The story starts with the ship’s main dining rooms, four of them, which are spread across two decks. Each offers a unique concept. They are: the Cosmopolitan Restaurant, current with the main dining experience fleet wide; Tuscan Restaurant, with Italian options; Cyprus Restaurant, with a “nod” to the company’s Greek roots; and Normandie Restaurant, with a French flair. All four venues seat around 360 guests each and will share the same base menu, with other menu items unique to each restaurant. “These are now smaller, more intimate dining rooms compared to the main dining rooms on the rest of the fleet,” Lutoff-Perlo said. Suite guests can look forward to exclusive dining in Luminae At the Retreat, offering fine cuisine. AquaClass guests can dine exclusively at Blu, which just saw a new menu installed fleetwide by Cornelius Gallagher, vice president of food and beverage operations. Among the speciality venues, Raw on 5 may steal the show aboard the new vessel. Described as a sophisticated yet approachable restaurant, the design starts with a raw bar display. The restaurant is also matched the ship’s to Magic Carpet (the ship’s cantilevered, floating platform). The venue extends right to the edge of the ship, giving guests a connection to the sea, according to Lutoff-Perlo. Le Grand Bistro, located in the ship’s atrium area, will serve up French options from breakfast to dinner, with a planter-edged sidewalk café look. A new twist, however, will be the innovative technology created by Skullmapping and presented by TableMation Studios, which Celebrity has exclusively licensed for use at sea. On select nights during a cruise, the technology will be activated as Le Petit Chef, an animated character, appears on each plate and prepares the course in video form on the plate. The animated character can cook steak, lobster and other items in cartoon form on the table. The video is delivered via overhead projectors, and Celebrity has liked what they have seen enough to commit to rolling it back across the fleet immediately, starting with Qsine aboard the Celebrity Reflection, where it will debut in March. In addition is Eden, which was announced last summer. What does Lutoff-Perlo think of that? “Every single thing (guests) love about our dining experience we’ve incorporated into the Edge. We’ve abandoned nothing, and we’ve embraced what all our guests tell us they want,” she said. “We are the culinary brand and our guests and the people that come to us expect us to continue to push the envelope as it relates to culinary aboard our ships. They want nothing less from us and they love the fact we do it ourselves,” Lutoff-Perlo continued, noting the entire food and beverage experience has been developed by Celebrity’s culinary team (at the brand level).